Brand New 35*60 Single Story House is available for sale in Soan Garden Islamabad, Block-H. located on Shalimar Road. Only 5-minutes drive from main Islamabad Expressway, Solid construction, having 3 bedrooms with attach bathrooms. 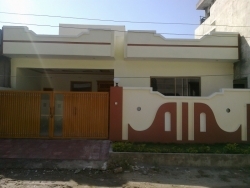 One Big TV lounge, One Kitchen, One Storeroom, One Drawing room , Car Porch , Decorative False Ceiling in complete house, Own Boring for water, Underground Big Water Tank, Facilities like TV cable,telephone cable, wiring for UPS etc. Price is negotiable. Contact for more details.